Gamepieces formed a small but coherent genre of work, popular in many northern European countries as decoration for the dining-rooms, gunrooms, garden rooms and studies of country houses. Ferguson may have specialized in this genre from the time of his training in Scotland, since he would have found a local market for it; when he moved to Holland he discovered a group of Dutch masters such as Jan Baptist Weenix and Melchior d’Hondecoeter, as well as van Aelst, Ruysdael, Lelienbergh and Vonck, who were expert painters of game. He was influenced by some of his peers, but his great skill in the depiction of birds, his draftsmanship, use of light & colour and evocation of texture, are equal to theirs, if not occasionally surpassing it. This example is characteristic of his dramatic compositions, and displays to the full his facility for reproducing form and texture. William Gowe Ferguson (1632/33- c.1695), whose names also appear as Willem, Gouw and Fergusson, was born in Scotland, leaving when young to settle in Holland, like many of his countrymen during the English Civil War. From 1648-51 he is recorded working as an artist in Utrecht, becoming a citizen in 1649. In the 1650s he travelled in France and Italy, and is then recorded in The Hague from 1660-68, in 1672, and – after a period in England – again from 1675-76. Whilst in The Hague it is said that he paid his rent partly by painting one picture a year for his landlord. In 1681, aged 48, he married a Swedish girl in Amsterdam; he may then have returned to Scotland during the last years of his life. He assimilated much of the contemporary Dutch style and subject matter, and is often classed with Dutch gamepiece artists. When in Italy he probably encountered Willem van Aelst, whose style informs Ferguson’s brushwork, use of chiaroscuro, compositional tricks, and the use of still-life accessories to set off the dead game. He also seems to have been influenced by Cornelis Lelienbergh or Elias Vonck, and possibly by Salomon van Ruysdael. He produced a substantial body of work, all of which exhibits the same technical skill and bravura compositional style. 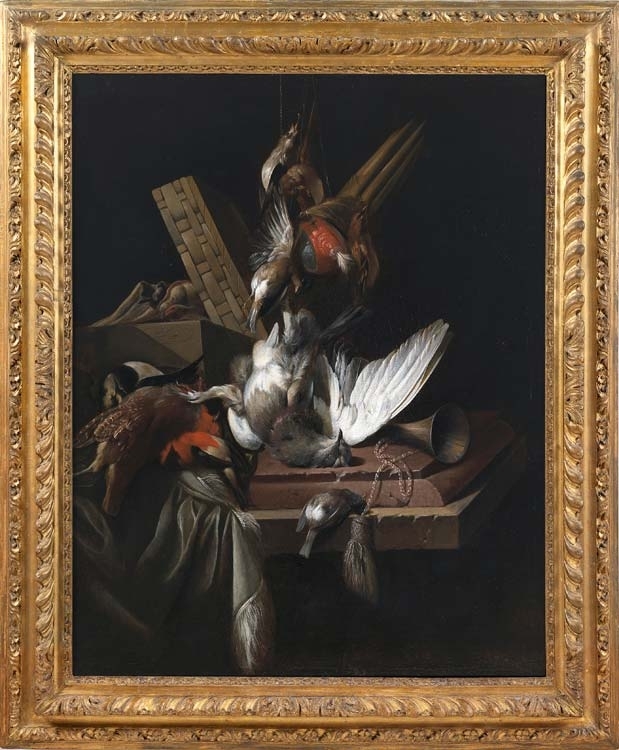 His earliest signed work is a Still-life of dead birds, 1655; his latest dates from 1695. Works in public collections include Coq et utensiles de chasse, 1662, Paris, Musée du Louvre; Still-life, 1684, London, Tate; Still-life with dead birds (a pair), 1679, Barnsley, Cannon Hall Museum; A pigeon and a magpie, 1685, Aberdeen Art Gallery & Museums; Still-life with dead pigeon, finches and falcons’ hoods, Manchester Art Gallery; Perdrix, gibier de plume et utensiles de chasse and Une perdrix suspendue, both c.1695, Musée des Arts décoratifs de Bordeaux. See Duncan Macmillan, Scottish art 1460-1990, 1990; James L. Caw, Scottish painting past and present, 1908; and Scott A. Sullivan, The Dutch gamepiece, 1984, New Jersey and Woodbridge.